TBS members enjoyed hearing two rising musical stars at a concert on 22nd November at the Church of St Thomas-on-the-Bourne. In an event sponsored jointly by the Countess of Munster Musical Trust, which selects talented young musicians and supports performances around the country, local music lovers heard a superb programme of music for violin and piano. The programme opened with the Solo Violin Sonata in A Minor by J.S. Bach BWV 1003. This piece in four movements was a tour de force by violinist Alexandra Lomeiko from New Zealand. In such a piece the solo instrument has to accompany itself in many sections by means of double stopping. A listener could therefore close his eyes and think he was hearing two violins. The second piece was the Sonata for Violin and Piano No. 12 in E Flat by Mozart and gave a taste of the wonderful skills of the accompanying pianist, the Latvian musician Antonina Suhanova. A beautifully crafted performance by both musicians was greatly appreciated by the audience. Following the interval, a short duet of the melody from Souvenir d’un lieu cher by Tchaikovsky was a familiar and beautiful piece delivered with great finesse. This led the audience to a piano solo by Antonina Suhanova that had the audience gasping with delight when she played the Prelude, Chorale and Fugue for Piano by Cesar Franck – a piece that is moody and stirring leading to a final climactic section that is overwhelming for the listeners when played with such flair. The final piece, played by both musicians, was the Carmen Fantasy by Franz Waxman, based on the music from the Bizet opera, a delightful piece that gave the audience something to hum on the way home. 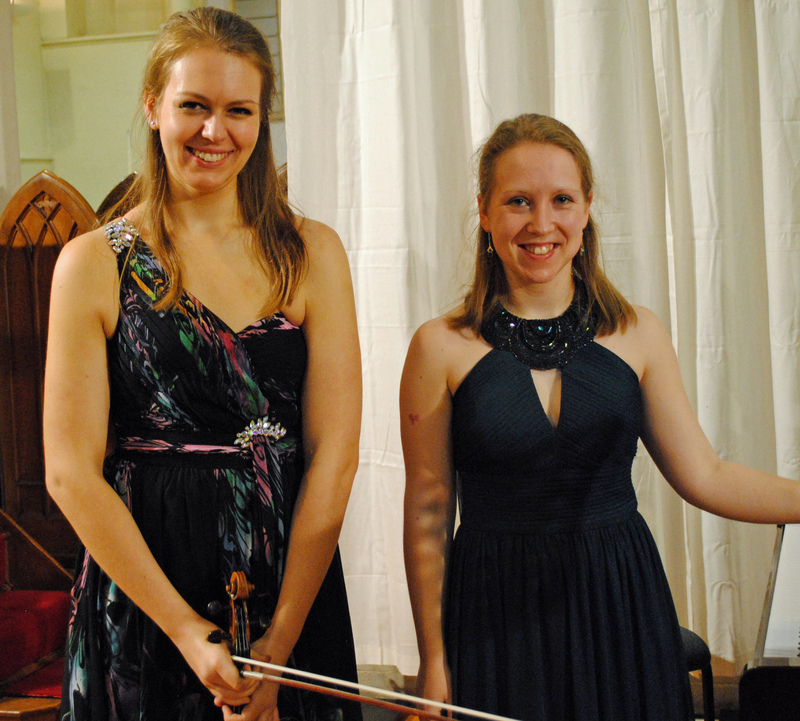 This event was a memorable concert by two excellent young musicians whose futures appear very bright. Alexandra Lomeiko was born in 1991 in Christchurch, New Zealand and started the violin at age five. During the following years she received many awards and prizes around New Zealand including the Most Promising Award at the Young Performer of the Year competition. In 2005, Alexandra was the youngest performer at the Pablo Casals Festival which led to her being invited to join the Russian Virtuosi of Europe Ensemble with whom she regularly collaborates to this day. During her time in London, she also performed as a soloist and chamber musician in many prestigious venues including, LSO St. Lukes, St. Georges Hanover Square, Watford Colosseum, Princess Alexandra Hall, Queen Elizabeth Hall, Barbican and Wigmore Hall. She has also been broadcast on BBC Radio 3 on numerous occasions. Alexandra has also performed internationally in many countries, including Brazil, Uruguay, Chile, Argentina, France, Germany, Switzerland, Spain, Russia, Israel, Poland and Turkey. A laureate of numerous competitions, Alex has won the Purcell Concerto Competition (2008), the Orpheus Chamber Music Competition (2007) and was awarded the special “Audience Prize” at the International Canetti Violin Competition in Israel (2010) and the “Best String Player Award” at the Gisborne International Music Competition (2012). Alexandra is also a very avid chamber musician and is a founding member of the Alluto Trio, Portobello Duo and Lumos Quartet all of which she regularly performs with across the U.K and abroad. As an orchestral musician Alexandra is a casual performer for the Oxford Philomusica, the London Symphony Orchestra with whom she collaborates through her placement on the LSO String Scheme and most recently she has been offered a place on the BBC Symphony Orchestras Pathway Scheme. Most recently, Alexandra and her colleague Luba Tunnicliffe formed a self-directed string orchestra known as The Silk Street Sinfonia which is scheduled for many upcoming performances throughout Europe. ​In 2010, she was awarded “The Henry Weinrebe Award” scholarship by the Guildhall School of Music and Drama (London) studied there with Professor David Takeno. Following her graduation in 2014, she commenced her postgraduate studies at The Royal College of Music with Yuri Zhislin. She is an RCM Lark Scholar supported by a Leverhulme Postgraduate Studentship and also by an award from the Countess of Munster Trust. Antonina Suhanova was born in Riga, Latvia in 1991 and started playing piano at the age of five. In 2012 she was awarded a scholarship to the Guildhall School to study with Professor Ronan O’Hora. She has won numerous competitions in Estonia, Slovakia, Italy, Spain and France. She has appeared as a soloist with the Tallinn Chamber Orchestra, Latvian Philharmonic Chamber Orchestra, Chamber Orchestra “Sinfonia Concertante” and Latvian National Symphony Orchestra under Andris Nelsons. In 2011 she represented Latvia in the 3rd International Festival “Rising Stars in Kremlin”, giving a debut performance with the world famous Chamber Orchestra “Moscow Virtuosi” under the leadership of Vladimir Spivakov. Since 2011 she specialises in violin and piano duo repertoire. She has participated in masterclasses with Vladimir Ashkenazy and Dmitri Bashkirov.